This past Saturday, I ran another local race. I know! Two races in as many weekends! But when the race is right here in town, I can't pass it up. 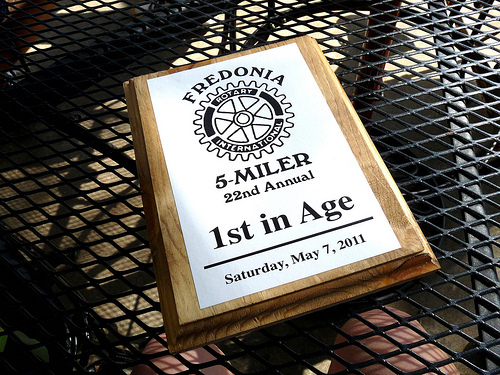 This weekend, it was the Fredonia 5-Miler, a five mile race that starts downtown by the historic Fredonia Hotel, winds through the college campus where I work (I sped up when I passed my building) and loops back for a downtown finish. The best part about this race is that after, all the runners, organizers and volunteers enjoy breakfast burritos, coffee and orange juice on the hotel's poolside patio. Because 50-odd sweaty and smelly runners are classy like that. 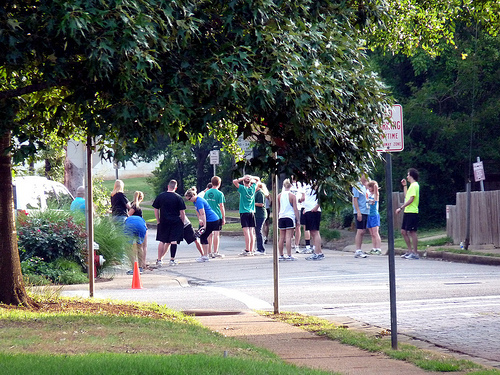 Runners begin to gather at the start line. This was my second year running this race. Last year, it was very hot and humid and I finished in 44:22. This year I've been running slower overall (not counting the marathon) and my training the last few weeks had been spotty. I didn't expect to PR, but I wanted to try and run nine minute miles - a 45 minute finish. The weather was about 70 degrees when we started at 8:00am with low humidity. So far, so good. Here's one funny thing that happened during the race: for most of the five miles, I was neck and neck with a girl who looked to be about high school age. I pulled in front of her; she pulled in front of me; back and forth we went. At the three mile mark I had a pretty good lead on her (maybe 100 feet) and I held that until we were about a half a mile from the finish line. At that point, her father jumped in the race and started running beside her, egging her on. "Come on, you got this, a little faster, you're almost there." And suddenly, the girl was passing me! I started clapping and managed to gasp, "Nice job!" And not only did she pass me, but she finished a good 30 seconds before I crossed the finish line. It's inspiring to see someone dig deep and push it in the final stretch. Oh hey! That's a nice surprise! That's right. Despite feeling undertrained and not competive, I beat least year's time AND placed first in my age group. My new five mile PR: 43:59. Not too shabby. The couple who places together stays together. 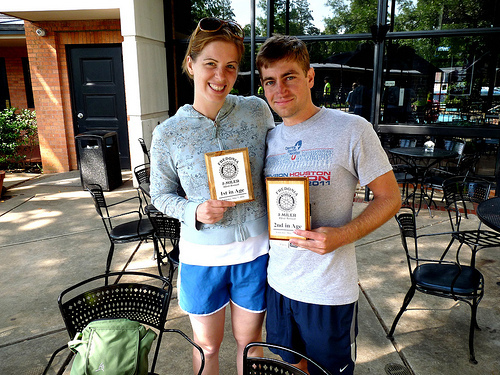 All in all: a fun race, a great morning and a lovely slice of Nacogdoches hospitality. Thanks to the Hotel Fredonia and the Nacogdoches Rotary Club for hosting the event!